I lost a great friend, I meet Juan one cold Thanksgiving day in Manhatten beach. I was alone surfer standing near the sand, debating on if I would be able to catch a wave or 2 before heading back to my mom’s house for Thanksgiving dinner. All of a sudden this guy pulled up and says ” are you going out?” I was thinking about it I said. and that is what started our friendship. I invited him back to my mom’s house for dinner and we spent the rest of the night talking about surfing and life. He ended up renting a room from me for about a year. If you want you can take a look at some of his work below. On October 1, 2017, about 1043 Pacific daylight time, a Cirrus Design Corp SR22, N6083D, was destroyed after impacting terrain while maneuvering at a low altitude in a remote mountainous area about 24 nautical miles west-northwest of Klamath Falls, Oregon. The private pilot and the sole passenger received fatal injuries. The airplane was registered to Cascade Forestry Inc., Gold Hill, Oregon. Instrument meteorological conditions were reported in the area at the time of the accident. The personal cross-country flight was being operated in accordance with 14 Code of Federal Regulations Part 91, and a flight plan was not filed. The flight departed Crater Lake-Klamath Regional Airport (LMT), Klamath Falls, Oregon, at about 1030, with the destination being Rouge Valley International-Medford Airport (MFR), Medford, Oregon. In a postaccident interview with the National Transportation Safety Board (NTSB) investigator-in-charge (IIC), a local Oregon State Trooper, who was conducting fish and wildlife surveillance in the area at the time of the accident, reported hearing the airplane pass overhead near his location. The trooper stated that the airplane was on a westerly heading at a very low altitude, in the clouds, “the engine was screaming,” and that the clouds at the time were at tree-top level. The trooper further reported that as the airplane passed over his position it started a turn to the left, and continued to turn left with the “engine still screaming.” This was followed shortly by the sound of a crash. The trooper opined that he and another trooper began searching for the downed airplane, however, by this time the clouds were at ground level, which hindered the ability to locate the airplane. The airplane was subsequently located the following morning on a ridge populated by thick tree growth and other vegetation. In a postaccident interview with the NTSB IIC, an acquaintance of the accident pilot reported that he had spoken with the pilot at LMT prior to his departure for MFR on the morning of the accident. The acquaintance, who is a retired US Air Force F-15 pilot, stated that he had pointed out the clouds to the west, which were in the same direction that the accident pilot would be taking to MFR. The pilot replied that if he needed to, he would climb above the clouds and look for a hole to get down through. If he could not find a hole, then he would return to LMT. 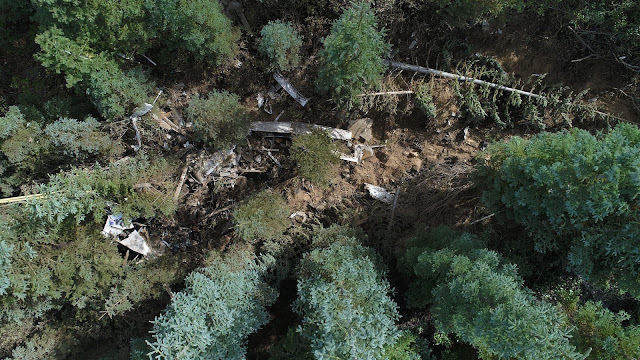 On October 3rd and 4th, representatives from the NTSB, the Federal Aviation Administration, Continental Motors, Inc., and Cirrus Aircraft surveyed the accident site. The airplane had initially impacted a 40-foot tall tree at about the 25-foot level on a northeast heading, then impacted the base of a second tree. It then continued northeast on about a 15° downslope before coming to rest about 100 ft. from the initial impact point. The airplane was highly fragmented during the accident sequence. All airplane flight control surfaces were accounted for at the accident site. The airplane’s parachute system was observed to have separated from its secured location by impact forces and was unfurled and located about 40 ft. northeast of the main wreckage and in line with the linear debris path; the parachute rocket motor had not discharged. There was no postcrash fire. The wreckage was recovered from the accident site to a secured storage facility for further examination. At 1053, the weather reporting facility at LMT, located about 24 nm east-southeast of the accident site, reported wind 310° at 9 knots (kts), gusts to 16 kts, visibility 10 miles, overcast clouds at 4,500 ft., temperature 11° C, dew point -01° C, and an altimeter setting of 30.14 inches of mercury. At 1053, the weather reporting facility at MFR, located about 27 nm west-southwest of the accident site reported wind calm, visibility 10 miles, scattered clouds at 3,400 ft., broken clouds at 6,000 ft., temperature 14° C, dew point 6° C. and an altimeter setting of 30.19 inches of mercury. An undated photo shows Chantal and Juan Canopii standing in front of the Cirrus SR22 N6083D. The couple died October 1st, 2017 when the plane they were traveling in crashed in western Klamath County. The cause of a southern Oregon plane crash that killed a Glendale couple remains under investigation, according to Oregon State Police Tuesday. Investigations led by the Federal Aviation Administration and National Transportation Safety Board are ongoing and who piloted the plane is also still not yet determined, said Lt. Cari Boyd, a state police spokeswoman. Juan Canopii, 54, and his 60-year-old wife, Chantal Canopii, died when their Cirrus SR22 plane crashed in a forested, remote area of western Klamath County near the Pacific Crest Trail, state police said. 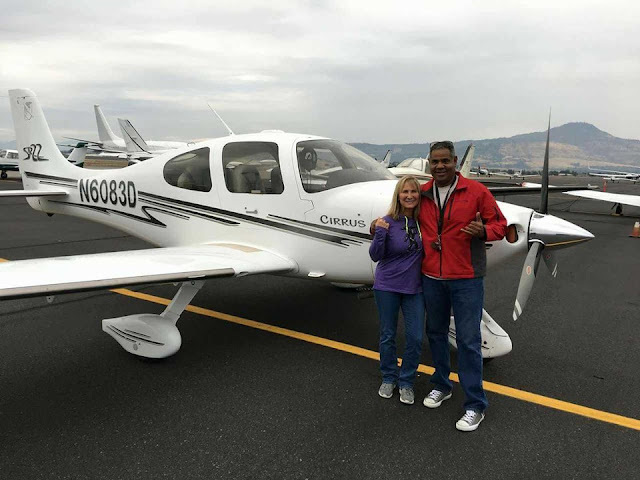 The couple was flying from Klamath Falls to Medford. Juan Canopii was a military veteran and comedian with television appearances that included bit roles in Portland-filmed shows Grimm and Leverage. 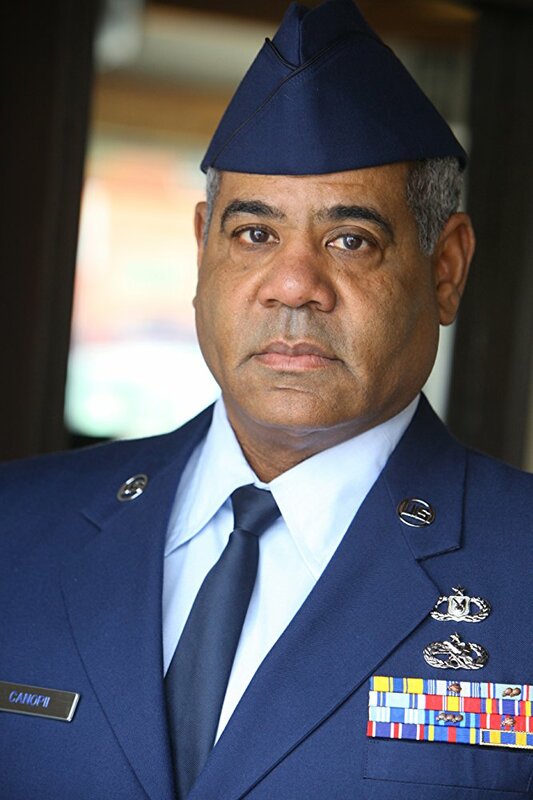 He served in the U.S. Air Force and was recently promoted to master sergeant in the Oregon Air National Guard, said Chris Barnett, a National Guard chief master sergeant who helped recruit him. He was also a private arms instructor. “He was a charmer and a great guy who loved life and always brought laughter wherever he went,” said Barnett, 46, of Grants Pass. Federal records show Juan Canopii received his private pilot’s license to operate a single-engine plane in December. According to state police, a trooper and volunteer were working Sunday morning between Burton Butte and Old Baldy Mountain when they saw the plane flying low. It sounded like it was having engine trouble, then they lost sight of the plane and heard it crash less than a mile away. Search crews couldn’t find any sign of the plane that day but resumed the search Monday morning in clearer weather. A helicopter found the wreckage that day. Sunday’s crash marked the fifth reported fatal plane crash in Oregon this year. Eight people were killed in the other four, including a California family of three and their pilot who died during an April crash near Harrisburg. Juan Canopii is a man of many talents, abilities, and experiences. He is a working film and television actor, an internationally touring comedian, a current member of the armed forces with 24 years of service, a community volunteer, surfer, certified scuba diver, pilot and aircraft owner, weapons expert, rancher, author, musician, singer, songwriter, producer, promoter, writer, and a fitness enthusiast. Glendale, Ore. — Friends of Juan Canopii showed an outpouring of grief on social media today. Juan Canopii and his wife Chantal Canopii both passed away Sunday while traveling from Klamath Falls to Medford in a private plane. Juan Canopii was well known in the local gun and sportsman community, as well as with comedians across Oregon and Hawaii. He was a firearms instructor, an air national guardsman, an actor, and a veteran. A fellow firearms instructor said Juan Canopii was almost ready to retire before he passed away Sunday. “He was this close to retiring from his service, and all of that’s gone, our hearts and prayers go out to his family and all the people that knew him,” said David Cunningham, who knew him for years through firearms training. Juan was described as a happy soul who was well liked by those who knew him. “He is always the first one to put his hand out and meet somebody. He was such a wonderful individual, cordial, well spoken, well mannered, stately, [and a] wonderful guy. [He was] always happy, I never saw him in a down mood, the guy was a great guy,” Cunningham said. Juan was featured in comedy shows with Shaquille O’Neal and Charles Barkley. 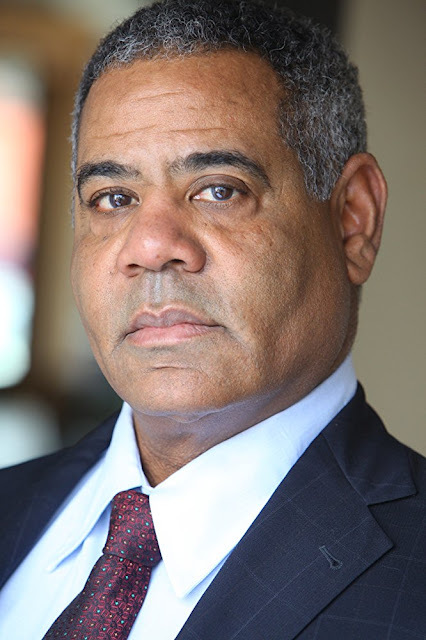 He had over a dozen professional acting credits and appeared in movies and television shows such as NBC’s Grimm, The Awakening, Even Stevens, and Little Nicky, according to IMDb. Cunningham told News 10 that the passing of the Canopii’s made him reflect on the shortness of life. “You can’t take anything for granted. You got to be right with your god, right with your loved ones, and I don’t let a day go bye that I don’t say I love you to my loved ones,” Cunningham said. Juan was 60 years old when he died, his wife Chantal was 54. 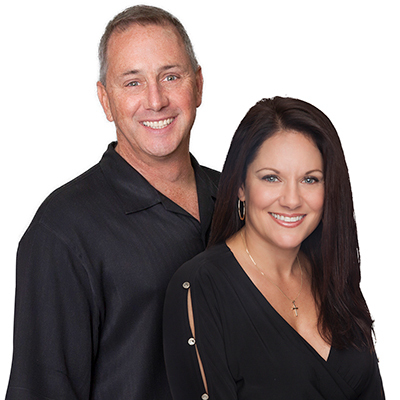 A Glendale couple was killed in a plane crash on Sunday. Lieutenant Cari Boyd of Oregon State Police says that on Sunday at around 10:45 a.m. a OSP Fish and Wildlife Trooper was working with a volunteer in a remote section of western Klamath County near the Pacific Crest Trail when they heard a low flying airplane. The area was between Burton Butte and Old Baldy Mountain. Lieutenant Boyd said the plane sounded like it was having engine trouble according to the trooper. The cloud cover was at treetop level and the airplane was not visible. Lieutenant Boyd says the plane was heard making an impact to the ground less than a mile away. First responders immediately started getting resources headed that direction to assist and find the plane. An initial search of the area by troopers and subsequent checks by Search and Rescue were unable to locate the plane. Weather conditions improved but Lieutenant Boyd says it was Monday morning before a helicopter was able to spot the wreckage and rescuers made their way through the thick timber to the location. Lieutenant Boyd says the plane was occupied by 54 year old Juan Canopii and his wife, 60 year old Chantal Canopii. Both were pronounced deceased at the scene. The plane was headed from the Klamath Falls airport to Medford when the accident took place. Staff with the Federal Aviation Administration and the National Transportation Safety Board will be taking over the investigation. The plane has been identified as a Cirrus SR22. The cause of the crash and who the pilot was is not yet known. Troopers with the Oregon State Police were assisted on the scene by Search and Rescue teams from Klamath, Douglas and four other counties. Staff from the Oregon Department of Forestry, the Bureau of Land Management, members of the Oregon National Guard and others helped with the incident. [UPDATE 7:07 p.m.] The plane has been identified as a Cirrus SR22 and the investigation is still continuing to determine the cause and who was the pilot. A plane traveling from Klamath Falls to Medford crashes in Klamath County on Sunday. Oregon State Police say at 10:43 a.m. OSP Fish and Wildlife Trooper was working with volunteers between Burton Butte and Old Baldy Mtn in a remote section of western Klamath County near the Pacific Crest Trail heard a plane crash less than a mile away. Emergency crews were unable to locate the plane on Sunday due to the cloud cover that was at a treetop level. Improved weather conditions on Monday morning allowed a helicopter to locate the wreckage and helped direct rescue crews through thick timber to the area. The victims of the crash were identified as 54-year-old Juan Canopii and 60-year-old Chantal Canopii, both of Glendale, Oregon was pronounced dead at the scene. The Federal Aviation Administration and National Transportation Safety Board will be taking over the investigation. A couple was killed Sunday when their small plane crashed while flying from Klamath Falls to Medford, Oregon State Police say. The wreckage of a plane carrying pilot Juan Canopii, 54, and Chantal Canopii, 60, was found Monday morning in thick timber in a remote area of western Klamath County near the Pacific Crest Trail, state police said. The couple lived in Glendale. A state police trooper and a volunteer were working Sunday morning between Burton Butte and Old Baldy Mountain when they saw the plane flying low, lost sight of it and heard what they suspected was a crash less than a mile away, according to police. The trooper and volunteer reported the plan sounded like it was having engine trouble, police said. Troopers, along with search and rescue crews, couldn’t find any sign of the plane that day but resumed the search Monday morning. The Federal Aviation Administration and National Transportation Safety Board will be leading an investigation of the crash. Klamath County, Ore. – Two people were killed when a small plane crashed in a remote part of western Klamath County, Oregon State Police said. On October 1 at approximately 10:43 a.m. an OSP Fish and Wildlife Trooper and a volunteer were working between Burton Butte and Old Baldy Mountain when they heard a low-flying plane. Due to clouds and steep terrain, the plane wasn’t visible, but it sounded like it was having engine trouble. The plane then made an audible impact with the ground less than a mile away. First responders were unable to immediately locate the plane. However, it was found the next day by a helicopter crew searching for wreckage and any possible survivors. Rescuers were eventually able to get to the location on foot. The plane’s two occupants – 54-year-old Juan Canopii and his wife, 60-year-old Chantal Canopii – were both pronounced dead at the scene, according to OSP. The Glendale couple was reportedly headed from the Klamath Falls airport to Medford. The Federal Aviation Administration and National Transportation Safety Board are investigating the incident. Police have released no further details. KLAMATH FALLS, Ore. – A couple from Glendale, Oregon, died in a plane crash Sunday, Oregon State Police said. Police identified the couple as Juan Canopii, 54, and Chantal Canopii, 60. The plane was headed from Klamath Falls to Medford at the time of the crash. Federal investigators are responding to take over the investigation. The plane hit the ground Sunday morning, within earshot of an Oregon State Police Fish and Wildlife Trooper and a volunteer working near the Pacific Crest Trail between Burton Butte and Old Baldy Mountain. The trooper and volunteer heard the plane around 10:43 a.m.
Search crews worked to locate the plane Sunday, to no avail. On Monday, weather conditions improved and a helicopter crew spotted the wreckage. Rescuers made their way through thick timber and reached the site on foot.